First off - thanks to gregorma for making the original THM file available!!! 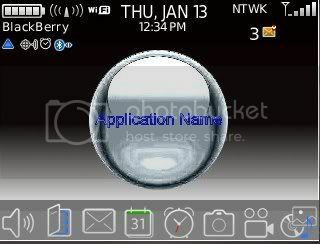 the screenshot was taken from Plazmic - when the theme is installed, only the selected icon is Silver, the rest remain black until selected. as you roll over them they "spring up" from the bottom of the screen. Pretty much left the rest of the theme alone. The main screen will still retain the Blue overlay as you scroll across the icon set. Remember to check out the original post from gregorma above. Last edited by lcfut; 12-15-08 at 03:35 PM. looks really good! could i get the .thm for this?